Property Info: 2 Bedroom, 2 Bath Beachfront Condo with 1100+ sq. ft. 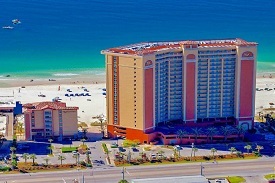 This Gulf Shores Alabama luxury beach front condo for sale at Seawind is an excellent real estate investment, the property is situated on the west corner on the 19th floor providing exceptional views of the white-sand beaches and the Gulf of Mexico. This resort home has granite counter-tops, maple cabinets and stainless-steel appliances in the kitchen, tile flooring throughout with popular contemporary furnishings with new living-room & dining-room room furniture – plus a bunk-room. This resort property is completely furnished and equipped with new HDTV’s, clothes washer & dryer. Great rental history with plenty of “owner time.” Enjoy the on-site exercise facility, indoor & outdoor pools, zero entry pool, etc. Seawind is easy walking distance to restaurants, shopping & entertainment. This could be it, don’t miss this one…come see this Seawind condo in Gulf Shores AL.